When choosing the Darrieus model vertical axis wind turbine for our project we had a lot to consider. Before we could settle on the Darrieus it was important to justify why we would pick that particular model over others. The first decision made was to choose the vertical axis wind turbine over the more standard and familiar horizontal axis wind turbine. The more familiar horizontal axis wind turbine looks like a windmill while the vertical axis models rotate around a vertical shaft. Each design has their own particular sets of pros and cons. A horizontal axis wind turbine (HAWT) is known to be more efficient and produce more power over time. This is generally due to the fact that the turbine itself is placed much higher up in the air on top of a shaft. While sizes for the actual turbines do vary, the standard practice to determine height of the HAWT is to make the tower two to three times longer than the blade length. This height creates one of the major drawbacks of the HAWT design. Because the turbine is located so high the motors, gearing, and everything mechanical are located at the top of the tower, this makes it extremely difficult to perform maintenance on the turbine. Also, a HAWT must always face into the wind in order to get rotation started which can cause problems in areas where wind direction can change. 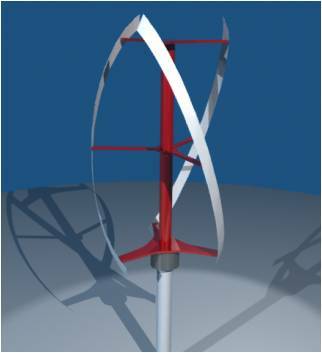 The vertical axis wind turbine (VAWT) has its own unique set of pros and cons too. VAWTs produce less power, but because of their design, they are also placed much lower to the ground. One of the intrinsic benefits of the VAWT is that because the entire shaft rotates, the motors can be located on the ground at the base of the turbine making for easy repair and maintenance. Because of the way they are designed, a VAWT is not dependant on wind direction and can maintain movement under any wind. One of the drawbacks of the VAWT is that it tends to distribute the forces that act on it in a manner that wears out the bearings on the turbine. VAWTs are much more suitable for urban areas due to the fact that they are smaller and not affected by wind direction. Once we settled on a VAWT, the next step was to decide between the two most popular designs: the Darrieus and Savonius models. The primary difference between the two is that the Savonius operates under drag forces, meaning that the wind actually pushes the turbine to make it rotate, while the Darrieus is operational due to lift forces created by pressure differentials created by the wind. The Savonius model produces greater torque but spins at lower speeds. Because the Darrieus operates through lift, it is capable of achieving rotational speeds several times that off the wind speed at significantly less torque. The lower torque is of benefit because it allows for less wear and tear on the components of the turbine. Savonius style turbines are capable of self-starting as long as there are three or more blades while the Darrieus design is incapable of starting on its own. We determined that the Darrieus model was superior to the Savonius model in every other aspect besides the ability to self-start. We saw the potential in the Darrieus as a small wind turbine adaptable to urban areas for low power applications, as long as the problem of the ability to self-start was addressed, which became our engineering goal. There are two main types of Darrieus turbine: the eggbeater style which features straight blades and the helix style with blades that bend into a helix shape. The helix design is actually a better and more sophisticated design because it distributes the forces acting on the turbine more evenly throughout the entire shaft, but due to our own restraints we are limited to the straight blade design. This will allow us to take less time and spend less money to produce our prototype design.